Christ's Love is a Choice! | Redeemed! Jesus prayed this prayer in the Garden of Gethsemane on the Mount of Olives, outside Jerusalem, just a few hours before his arrest leading to crucifixion. Jesus knew the torture and death He was facing. He knew the level of rejection coming from the very people whom He came to save. He knew the full measure of sin of the entire race of mankind to be placed on Him as He suffered. Jesus also knew He was born into the race of mankind for this purpose. He knew the love that the Father has for us. Jesus fully lived out the Father’s love toward us, during His time on this earth. Jesus knew that it was only through His torturous death that mankind could be redeemed from Adam’s covenant of slavery to the kingdom of darkness, and restored to right relationship with God. Can you hear the agony of His prayer? Can you hear the passion of conflicting desires? Can you hear the choice…the moment of decision…of choosing one desire as a higher priority than the other? Can you hear His love…love for the Father…love for us? 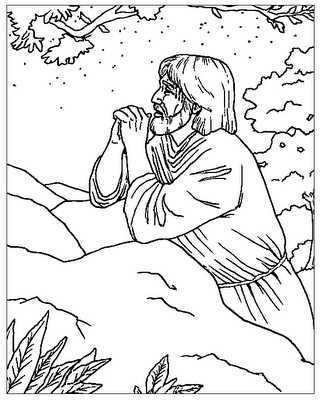 In this prayer we hear the competing desires of Jesus in His moment of agonizing decision. Jesus came for this purpose…yet still had a decision to be made as He stood at the edge of action. Jesus walked His entire life in perfect submission to the Father’s will…yet still had to choose the will of the Father at a critical moment. Jesus completely loves both us and the Father…yet still had to make a deliberate choice of sacrificial love being a deeper desire, a higher priority, than self-preservation. Through this prayer we are granted insight into Christ’s private thoughts and prayers. I tend to think of Jesus as simply being at one with the Father…as not having to put any effort into that oneness beyond simply being who He is. Not so! Jesus had to make daily choices and decisions between competing desires, just as I do…except He always chose the highest priority based on His deepest desire, to do the will of the Father. This realization makes His gift yet more precious to me. He had a choice! Just as God respects our choices and holds our free will sacred, Jesus also has a free will and the ability to choose. Prophetic fulfilment and the eternal destiny of mankind relied on one man’s choice, yet the Father trusted Jesus to choose. He could have chosen to forego the cross…but He didn’t. Not only was it a free choice, but it was also an extremely difficult choice. We hear the agony in His words! This was something Jesus desperately did NOT want to do! And yet, even more than He did not want to face the cross, He DID want to fulfill His purpose in doing the will of the Father to redeem us. This is sacrificial love! If it were an easy decision, it would not be sacrificial and would not demonstrate the same depth of love. Jesus did not choose to die because He wanted death. He chose to die because, although He desperately wanted to live, He wanted more to fulfill the Father’s will in redeeming us from the kingdom of darkness. Competing desires…deep, deep desires…mutually exclusive choices…where one must be chosen over the other…and Jesus knew which desire was deepest. What passion drives your daily choices? This entry was posted in free will, God's Position toward Us, Redemption and tagged covenant, free will, God's will, grace, Jesus, love, prayer, redeem, redemption by joe. Bookmark the permalink.